*Read the buttons tool-tips for more detailed information on how to use! The point of this script is to speed-up workflow on my architectural visualization scenes with these simple combinations of tools. Smooth selected objects for the value. Place pivot on object surface where you need it. Place selected objects pivots on top. Place selected objects on bottom. Place selected objects pivots in center. Place selected objects pivots on 0 (xyz zero). Weld vertices on selected objects. Unify normals on selected objects. Deletes edges on flat surfaces. Select vertices that uses only two edges. New name of all selected/detached. Detach all elements in selected objects. Resets xForm on selected objects and splines. Display selected as box. Right click to disable box display. Display selected Backface Cull. Right click to disable selected Backface Cull. Insert edges and sets flow on selected edges normal. Add shell modifier to selected objects. Add FFD 2x2x2 modifier to selected object/faces for quick modification. Select all Proxies in scene. Display selected proxies as Point Cloud (Corona) and Faces (Vray). Display selected proxies as Box. Display selected proxies as mesh. Select all Helpers in scene or view. Select all Geometry in scene or view. Select all Splines and Shapes in scene or view. Select all Cameras in scene or view. Select all Lights in scene or view. Turn on or Right click off selected Lights (VRay and Corona) and camera targets (VRayPhisical and Physical). Change selected Lights and Cameras white balance. Lock selected (If locking camera or sun, it will also lock their target). Unlock selected (If unlocking camera or sun, it will also unlock their target). Selects all objects without materials. World coordinate system for randomizations. For scale this will be ignored, local only. Atach all selected into single object. More objects=slower. *Tested only on 3ds max 2016. Quick assign ID to selected. Quick select objects by ID. Random select objects in selection. *Tested only on 3ds max 2016. UVW Box mapping on selected objects (600x600). UVW Plane mapping on selected objects (600x600). UVW xForm modifier on selected objects. Remove materials on selected objects. Disable/Enable displacement on all applied materials. Random UV offset on selected objects. Show materials in viewport. Right click to hide. Layers for architectural visualization scene. Clean empty layers, garbage, trackview nodes, fixes large file size problem. Popular aspect ratios presets for output size. Copy (Save) selected for merging into another 3ds Max application. Paste (Merges) previously Copied selection into exact position. -Added quick lister with interactive selections! -Collector does not automatically assets, now it only collects files into one folder. 2014-not tested on lower version but it should work. Some of code done in 2016 may not work in lower versions. Submitted by Malte on Wed, 2019-04-10 08:25.
using max 2019, win 10 64 bit. i had v 2.26 installd for max 2017.
never had a problem installing it but it won´t install on max 2019.
ps: i had to run max as an admin. i normaly don´t have to do that when installing scripts. Submitted by Darawork on Tue, 2019-01-22 09:28. Submitted by chinaman on Wed, 2018-10-03 15:52.
how it make in float window? Submitted by strale88 on Sun, 2017-10-29 04:37. There is a button "Rnd Wire" in the script witch does exactly what you need. Submitted by strale88 on Thu, 2017-10-26 00:38. @vinyvince Sometimes scripts can't run until you run 3ds max as admin and then run the script. Submitted by Malte on Fri, 2017-08-25 08:05.
it would be nice to have your script assigning material ID´s when detaching. either random (give a choice to choose how many differnet material ID´s), or one explizit ID for each element. i now use two tools for that task (yours and Tik_Mass_Randomizer). Submitted by Malte on Fri, 2017-08-25 07:55. "Can-t install it ... run script install failed on max 2017 sp4"
runs fine here with 2017 sp3. where did you get a SP4? or is this a typo? Submitted by vinyvince on Fri, 2017-08-18 06:14. Love this script, very disapointed i can t use it for now, do you mind to help please? Submitted by strale88 on Fri, 2017-03-03 02:02. 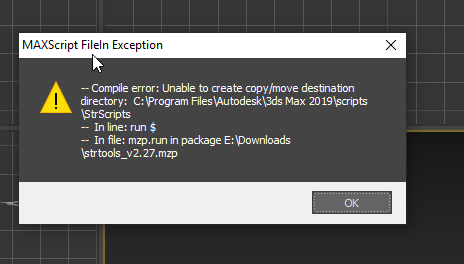 @3dbybrunolopes Which 3ds max version are you using when getting the error? 2017? Submitted by Turnim on Tue, 2017-02-21 19:22. If you are working with 3ds max many hours on a daily base then this script is definitely a good timesaver.